While the surveillance market is crowded, the intercom space is relatively sparse. In this note, we survey manufacturers specializing in enterprise intercoms including Commend, Stentofon and Aiphone, contrasting their various strengths and weaknesses. Multisite Communication allows separate intercom systems to function as a single system at a central administration point. Mass notification: In some cases, enterprise intercoms are also PA, or 'public address' systems, where a single point can broadcast messages to multiple areas, even different sites, at once. Door Access/Gate Operation: A core feature for enterprise intercom systems is the ability to unlock doors or operate gates remotely, based on intercom requests. Video Surveillance integration: pushing an intercom terminal call button servers to trigger a camera to record video, and sometimes audio, of the exchange. This integration serves to aid communication and record significant activities in a way that video motion detection alone cannot. Each system mentioned below is an IP-based intercom system, ideal for use in enterprise environments where a well developed LAN is present. Even though wireless intercom systems are available, privacy regulations and interference from external sources exempt them from being considered in every application. In general, the product series mentioned below are designed for general purpose and if specialty applications or integrations are desired,the information may change. Stentofon offers the greatest capacity, by default, with over 500 stations supported from a single unit. This may include IP stations located remotely from, but still network connected to, the primary AlphaCom server. The cost of migrating existing analog terminals into Stentofon's offering should be carefully considered, as no external analog encoder exists. Different, more expensive, AlphaCom servers must be specified based on total number of analog stations to retrofit existing installations. Here is a video overview of Aiphone's line. Aiphone does not support full-scale network addressing. The IS Series is limited to 32 IP addressed units, while the total system population supports tens of thousands of analog stations designed to use CAT5/5e/6 cabling for transmission. However, the IS series supports widespread use of video at the intercom terminals. Because Commend and Stentofon are dealer-only product lines, system pricing is difficult to accurately estimate. Addiitonally, both lines feature a variety of integration options that the Aiphone line does not tightly support. However, the Aiphone line is considerably less expensive than the dealer lines, and does not include added expenses like product licenses. Milestone VMS: Out-of-box platform support within XProtect, including recording of video intercom stations. Tetra Mobile Radio: Integration with 'walkie-talkie' mobile radio system. ComWIN: A maps based 'building management' platform including 'panic alerts', logging, and access control. 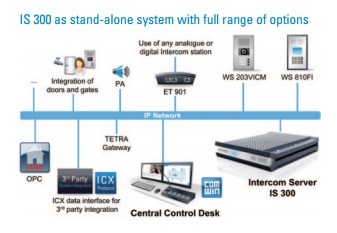 Commend is a good choice when the intercom system is intended to be a part of a converged, multi-system platform. Commend's pricing structure is complicated, and determining exact project pricing requires a deep understanding of the company's product and upgrade plans. Stentofon: The company's pricing is close or fractionally beneath Commend. Stentofon has focused on audio quality and product development rather than tight integration. In general, Stentofon focuses on design features like redundancy and rugged component design. Stentofon is competitive, or fractionally less expensive than Commend, although final dealer discount varies. Stentofon is a good choice when high-quality audio is desired. Aiphone: Far and away, Aiphone is the least expensive of the three options. In some cases, pricing is as much as 50% less than rivals plus the IS series does not require the cost of licensing compared to the other options. However, integration into other systems is much more difficult than the other two options. Aiphone is a good choice when a simple, minimally integrated intercom system is desired.